Nonograms, Paint by Numbers, Griddlers, whatever you want to call them, they’re definitely an up and coming puzzle type which could easily be the next big thing. Puzzles may not seem like an especially hip and happening scene, but just think about the way sudoku exploded not so very long ago, it’s worth sitting up and paying attention. Nonograms have been described as a combination of sudoku and crosswords, but you really have to try it out to understand how it works. What you should know is that it does require a little trial and error and a lot of logical thinking, so if you want to give you brain a satisfying mental workout, nonograms are definitely worth a try. Nonogram Madness in particular is ideal for the beginner or for the Paint By Number purist who doesn’t want to be distracted by rainbow-hued pictures of dolphins and birthday cakes. As an introduction to the genre, Nonogram Madness is actually a quite fantastic, because it really strips down the puzzles to the very basics. 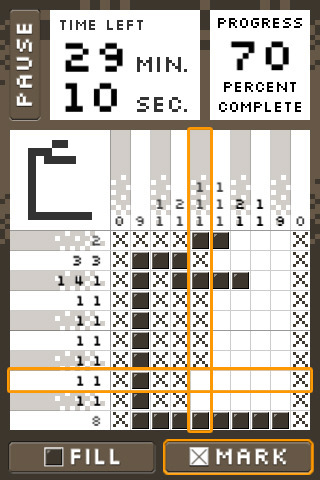 Don’t be put off by the relatively bland looking monochrome graphics, because that actually makes the puzzles far more approachable than the candy-colored hues of the more complicated Picross games. 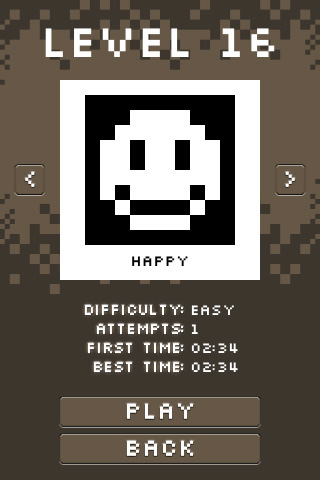 The fill interface takes a bit of getting used to, as you must manipulate a couple of orange cursors to line up at the appropriate square, but once you’ve gotten that down, it’s actually very easy to fill in the grid, and it helps sidestep the issue of false tapping which plagues many of these games. Unfortunately, there is no landscape mode or ability to zoom, which does make it a little harder to see at times, but the grid always stays the same size, so you’re never squinting that badly. While the puzzles themselves are quite enjoyable, veterans will likely be a little frustrated by the level select interface. Although you do not have to slog through the early puzzles in order to access the more challenging ones, it does take awhile to cycle through them one by one to reach the higher difficulty levels. A better option would have been to have the puzzles grouped by difficulty for easier access. One thing that really surprised me about Nonogram Madness was the fun chiptune soundtrack. It’s perfectly suited to the pixelated nature of the picture puzzles and also gives the game a lot of retro character and flair. At $2.99, the price might seem a little high for such a simple puzzle game, but Nonogram Madness really offers hours of entertainment broken down into 5-minute chunks. If you’re a sudoku fiend in need of a new fix, I would highly recommend checking out Nonogram Madness. AppSafari review of Nonogram Madness was written by Tracy Yonemoto on October 5th, 2010 and categorized under App Store, Art, Featured, Games, Puzzler, Strategy. Page viewed 4703 times, 1 so far today. Need help on using these apps? Please read the Help Page.